No other European metropolis has so much changed in recent years. Walking through Berlin you will see evidence of different historic periods in a short time, from medieval buildings to the famous sightseeing landmarks like the Brandenburg Gate, Reichstag and East Side Gallery. Today Berlin presents itself as a young, dynamic metropolis open to the world right in the heart of Europe, setting new trends in architecture, art and fashion. Discover its diversity - enjoy Berlin! 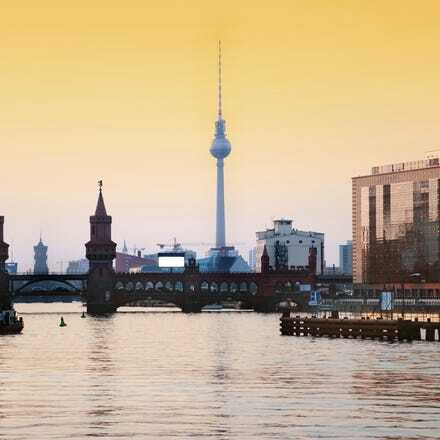 Catch a cheap flight to Berlin with Aer Lingus and enjoy a quick and comfortable journey. We operate frequent departures to Berlin from Dublin Airport Terminal 2. Once you reach Berlin Tegel Airport, the city centre is just under 8km or 5 miles away. Berlin is full of things to do and see, every single day. Summer roof terraces and beach bars, winter Christmas markets, shopping, sightseeing and museums at any time of the year. Its a city brimming with history, visit the Brandenburg Gate, the Reichstag, the remains of the Berlin Wall and then take in some fabulous food in one of the citys many avant-garde restaurants. You will not be disapointed! When hiring a taxi in Berlin, you pay a basic charge of €3.90 plus €2.00 for each kilometre travelled. The "Kurzstrecke" (short distance) tariff gives you a journey of up to two kilometres for €5.00 – in this case, however, you have to flag down the taxi yourself. The "Kurzstrecke" tariff does not apply if you order a taxi or get in one at a designated taxi-waiting spot. (English language taxi-ordering service around the clock) taxi-berlin.de. Comfortable, affordable and straightforward to use and get around Berlin’s sights: use the extensive network of city and metro trains, as well as buses and trams. Trains run on the honor system and there are no ticket barriers to use the U-Bahn, S-Bahn, trams or regional trains. On buses, you need to show your ticket to the driver and enter through the front door. Plain clothes controllers patrol all public transportation, so make sure to validate tickets before boarding. You can find out about public transport fares, schedules and contact information here.